Bob and Trish Eberhart need your help. As some of you may be aware, Trish Eberhart, 57, the love of Bob Eberhart's life and wife of 38 years, is under the care of hospice due to a series of illnesses. Compounding matters, 24 months ago, while on duty as a police officer, Bob’s police cruiser was rear-ended resulting in serious brain injuries causing him to lose his job with the Colorado Springs Police Department. On every shift for the past 23 years, Bob, 58, risked his life to protect the citizens of Colorado Springs and keep us safe. On one such shift, Bob was exiting his cruiser behind a traffic accident when he was rear-ended by a civilian’s truck knocking him unconscious and totaling his patrol car. Bob sustained serious brain injuries, resulting in excruciatingly painful and debilitating headaches, loss of concentration and inability to fully function. His injuries forced him into early retirement by the Colorado Springs Police Department; he received only a fraction of his retirement. Bob has received no compensation/settlement for being irreversibly hurt on the job and he lost the family’s health insurance, life insurance and other benefits due to the fact he was not able to process the actions necessary to continue the benefits due to his brain injury. 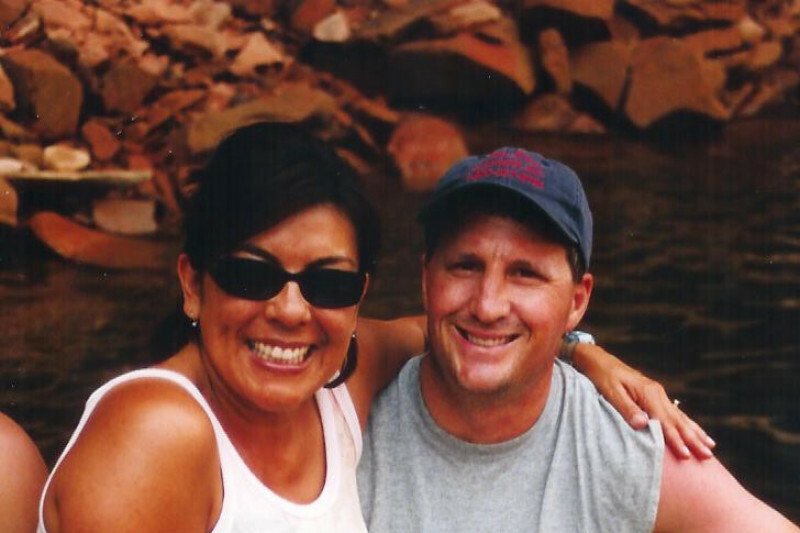 Tragically, as Bob was fighting crime on the streets of Colorado Springs, his wife Trish, the loving mother of their two beautiful children, was fighting a series of illnesses that took three years to diagnose and nearly bankrupt the couple. Trish was put on hospice care in November. Trish's exorbitant medical expenses and costs of her prescription medication, compounded by Bob's injury and loss of his job, have depleted the couple's resources. Bob and Trish are model citizens, extraordinary neighbors, and exceptional friends who have given a lot to their Colorado Springs community. To know Bob and Trish is to love them. Today, they need the help of their community. Please help make a difference. All contributions, no matter how small or large, are greatly appreciated. Trish aka Patty and I met in 1977--she was 17 and I 18. We married January 27, 1978, while she was still a senior at Widefield High School. We started a family about a year later. I’m very proud that Patty was able to instill strong morals and values in our son, daughter and me. Patty brags that raising all three of us kids was her biggest challenge. Patty and I have almost 38 years together investing effort, trust, love and tears to mold a marriage that we both are very proud of and still cherish today. Patty began having health problems in 2009, requiring trips to doctors and hospitals. The nights were filled with abdomen pain, exhaustion and fear. In 2010 we became even more familiar with our local hospital staff due to well over a dozen visits that year. In 2011 we continued visits--in September Patty spent 11 days inpatient testing, which resulted in doctors telling me that they didn't know what was causing Patty’s health problems and then asking me if I had ever thought of hospice. I fired them and began a search for someone who could save my wife’s life. We finally found a new hope for Patty at CU Medical at the Anschutz Hospital in Aurora, CO where our doctor diagnosed Patty with Scleroderma, Raynaud’s, connective tissue diseases and other problems. 30% of patients live up to 5 years once diagnosed. Even with insurance, the bills mounted to a point where I understood why people fold to bankruptcy. Today, just over 5 years after Patty’s diagnosis, she is in the grips of the disease that is robbing her of her sharp mind, quick wit and beautiful smile. I struggle to find ways to keep her weight over 90 pounds. I finally had to enter Patty in a hospice program this November 2016. I have been a police officer since January 1992, working multiple assignments in an effort to control pattern crimes. On January 2, 2015 0800 hours, I stopped behind a traffic accident on I-25. As I was opening my patrol car door to get out, a truck crashed into my cruiser, crushing it and knocking me unconscious and totaling my patrol car. The accident ended my career because of a brain injury. Patty’s and my plans for sound retirement and a comfortable quality of life for her were gone. I lost my health insurance, life insurance and other benefits due to the fact I was not able to process the needed actions necessary to continue my benefits. Almost 2 years post my career-ending brain injury, I see that the accident was a blessing in disguise because I can now care for Trish at home where she is most comfortable resting and holding her mentally unstable Apple Head Chihuahua. The hospice care facility told me Patty is at “end of life” and she could pass at anytime; she could also last for several years, requiring full time care to keep her comfortable, safe and somewhat feeling that her life still has a reason. Trish is devastated that she needs assistance for simple tasks such as opening the lid of a container, pouring a cup of broth, or hygiene. At times, she sleeps up to 18 hours a day due to the heavy medications required to keep her comfortable. I cannot emphasize enough that my career ending accident was a blessing for my wife and me. I get to care for her to the end of her precious life, but until she is gone and while she sleeps I will continue to search the World Wide Web for a doctor or hospital that may have the most recent medicine that may reverse or cure the diseases that are sucking the life out of my soul mate. It is with a heavy heart that I let you know last night we lost Trish to heaven. Thanks for so many memories that will be with me forever!